Bottom Blasting and Bottom Painting, New Jersey, PA, DE and MD. We also do mobile barrier coating and ablative bottom painting. 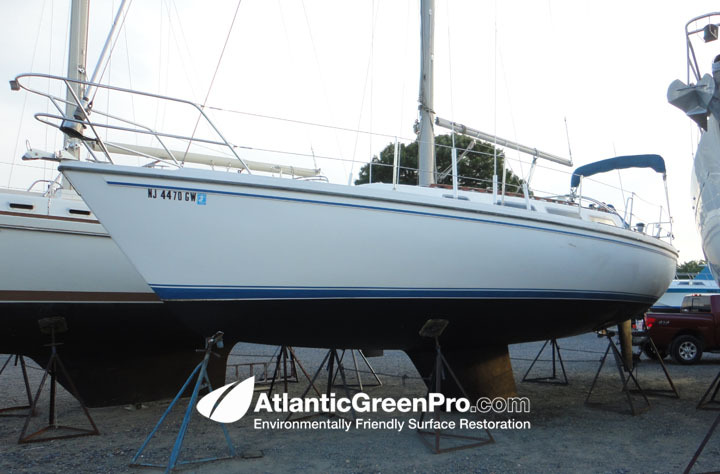 We're new here to Cruisersforum, but we do a lot of mobile Farrow System boat bottom blasting between New York NY and Baltimore MD... mainly New Jersey, eastern PA and Delaware as well as the Raritan Bay and lower Hudson. 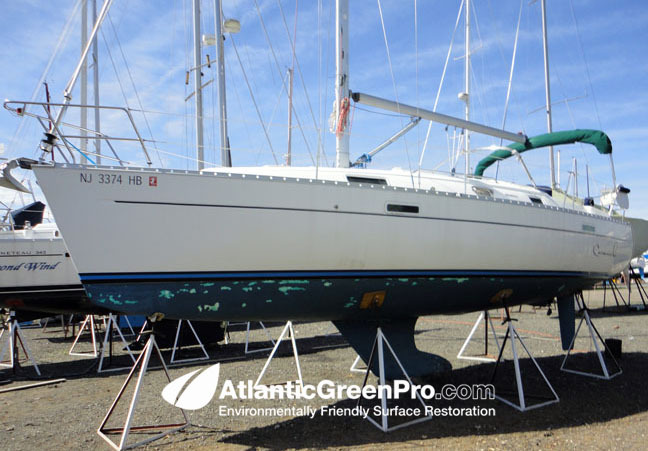 Our process is simular to Soda Blasting... only it doesn't make the nasty dust and it's a lot cleaner both on your boat as well as around and in your marina. 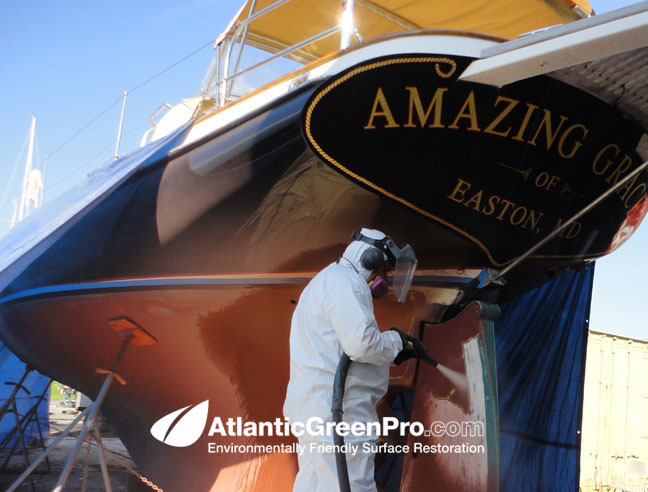 Many of the boats we blast we also barrier coat and ablative paint. 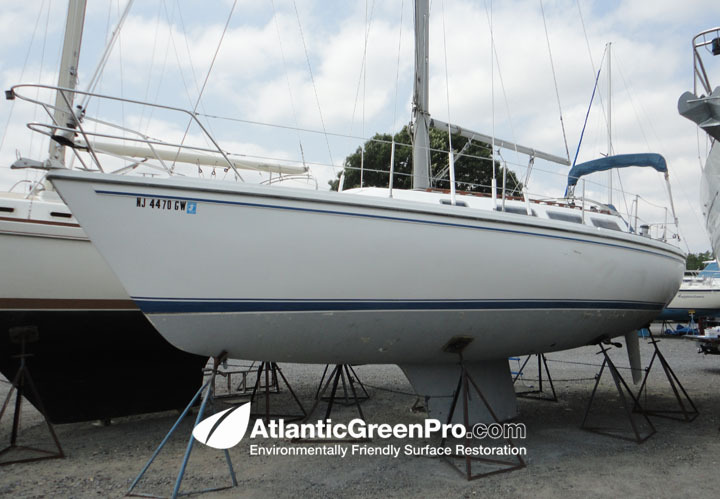 Below are a few Sailboats we've done recently for our customers and again we're mobile and work on a lot of different type restoration projects. 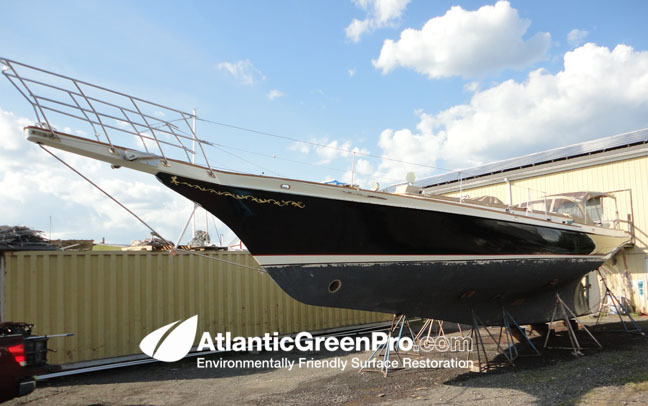 48' CHERUBINI we recently stripped for Cherubini Yachts... note no dust! CATALINA after Farrow Blasting... NOTE we took it down to just the old barrier coat. CATALINA after two coats of SeaHawk Tuff-Stuff epoxy barrier coat. MORGAN RESTORATION after Farrow Blasting... NOTE we took it down to just the old barrier coat. MORGAN RESTORATION after two coats of SeaHawk Tuff-Stuff epoxy barrier coat. Re: Bottom Blasting and Bottom Painting, New Jersey, PA, DE and MD. 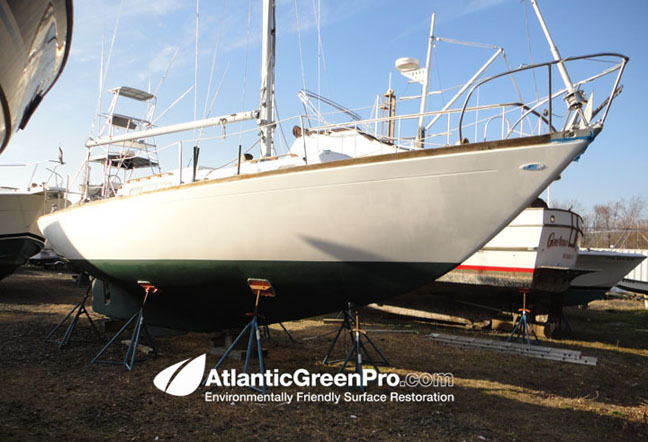 If you're interested in having your boat Farrow Blasted by Atlantic Green Pro THIS FALL then you might want to get it booked now? Our fall 2013 calendar/schedule is filling up fast. > Mobile Farrow System wet abrasive blasting bottom paint removal (NO DUST). > Farrow System wet abrasive blasting bottom paint removal. 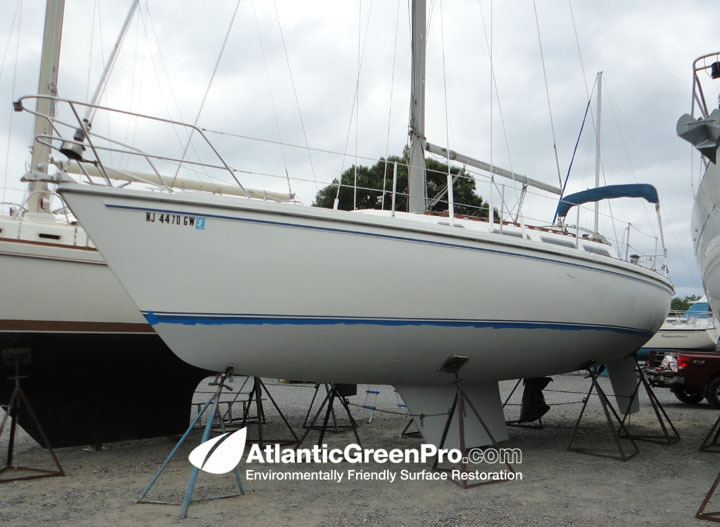 > Boat bottom painting (Barrier coat and Ablative painting) GREAT PACKAGE DEAL! 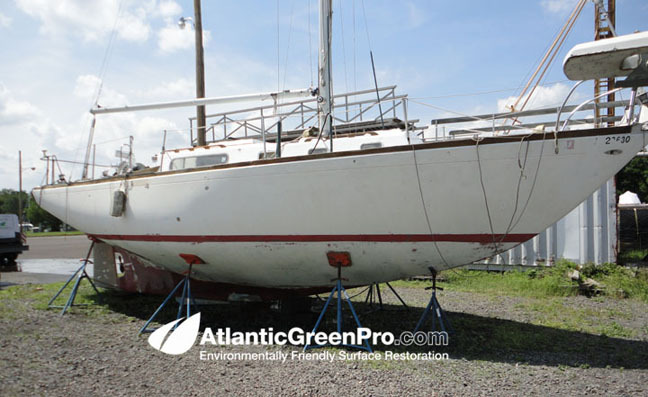 That doesn't make sense - the price will be different depending on the size of the boat, the amount of paint needing removal, the type of paint already on, and probably the distance travelled. You also won't get prices in advertisements for boat painting, along with many other things. Yet somehow their website allows you to request a quote. Are you saying they are unable to figure out how to price their own work? Obviously they do, but they're not telling you this process. And I don't trust any of them. It's not just the various factors that determine the price. It is an opportunity to take advantage of customers. Just because something is common doesn't mean you embrace it implicitly. I'm not implying this company is doing anything wrong with their customers. I'll leave it to you to understand the implications of a loophole around possible haggling. Haggling is illegal, but if there's no advertised price, you cannot be bound to a guarantee that doesn't exist. So in this case it's not illegal. People are more compelled to buy something if they know the price. The reason many services don't advertise price is because there isn't much competition for you to go elsewhere. Services aren't as common as commercial products. O_q.... I have a very simple formula for pricing mobile boat bottom paint removal with our Farrow System. The square footage calculation obviously isn't correct with the curvature of boats, however, the calculation is fair as they are all applied to boats. 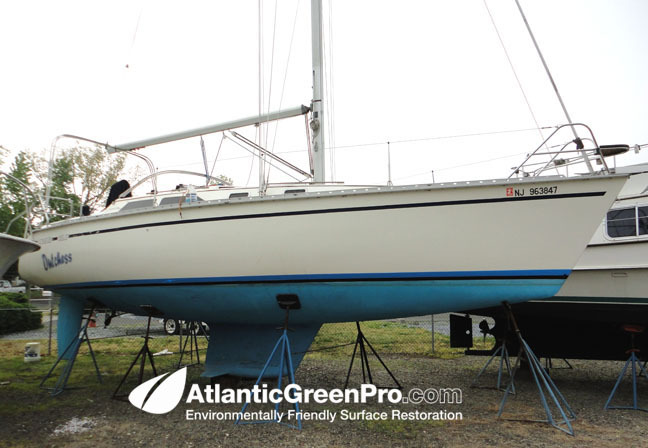 The square footage calculation is based on a combination of factors including the boats foot print "length x width" area + the additional length x width area of the ground cover plastic and required tenting of the boat.... and finally the actual surface area where the paint is being removed from the boat. which I believe is what you are talking about. The formula is very fair and we don't have any hidden cost like some have with additional fees for tenting and waste disposal. When you factor in everything we offer and the quality of the finished product our price is a real bargain. I recently had my massive 52' LOD by 15.5' by 8' 9" draft bottom peeled for $1100. The Peeler guarantees exactly the same amount is removed from the bottom everywhere, assuring a fair bottom. Other methods just blast until the coating is removed. If the coating is of an uneven thickness, and it always is, this assures an unfair bottom. Do you fair your bottoms after blasting and before coating? Do you assume the gelcoat is exactly the same thickness everywhere and skip fairing? How do you capture and filter the contaminated water from blasting? I recently had my massive 52' LOD by 15.5' by 8' 9" draft bottom peeled for $1100. I don't know where you got your price but here on the east coast peeling is usually twice as much as what our process is and most guys offering peeling are fly by night operations which are out of business in less than one season.... and most marinas don't even let them in because of the mess they make. The Peeler guarantees exactly the same amount is removed from the bottom everywhere, assuring a fair bottom. Everyone removing paint guarantees exactly the same amount of paint removed and clean gel-coat... if you're not removing the paint you're not doing your job and our bottoms are the fairest. coating is of an uneven thickness, and it always is, this assures an unfair bottom. 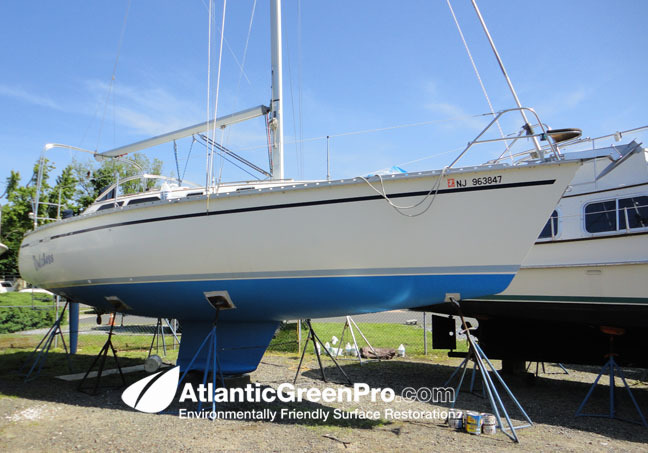 Our process is different from dry blasting or soda blasting and is much gentler on your boats bottom producing just very clean even gelcoat... the pictures above are just a few of our examples. Do you fair your bottoms after blasting and before coating? You only fair the bottom if we opened up any blisters that require repairing, yes our process can open blisters if required. Do you assume the gelcoat is exactly the same thickness everywhere and skip fairing? No gel-coat is even, because during the construction of the boat the gelcoat is applied by a person applying it with a sprayer and is never done evenly... I've done hundreds of boats and I can tell you just how a boat was laid up. How do you capture and filter the contaminated water from blasting? Also our process delivers the cleanest gel-coat period... the above photos are just some of the bottoms we've done. Peeler is vacuum extracted, we don't even have to tent off, zero dust hits the ground, much cleaner. It's cheap because there's no setup and clean up, one day to peel a 50 footer. I've run a production Gelcoat booth at a production facility before, and Gelcoat is never sprayed very evenly due to the contours of the mold. It will generally be twice as thick around the turn of the bilge, at the stem, etc. Often leftover gel in the pot is poured into the mold. Longitudinal seams from split molding is another issue. Your method is far from "the fairest" (lol Snow White). And clearly not the cheapest either. I don't think he is talking about removing gelcoat - just paint. So the thickness of the gelcoat isn't relevant as long as the original mold was fair. 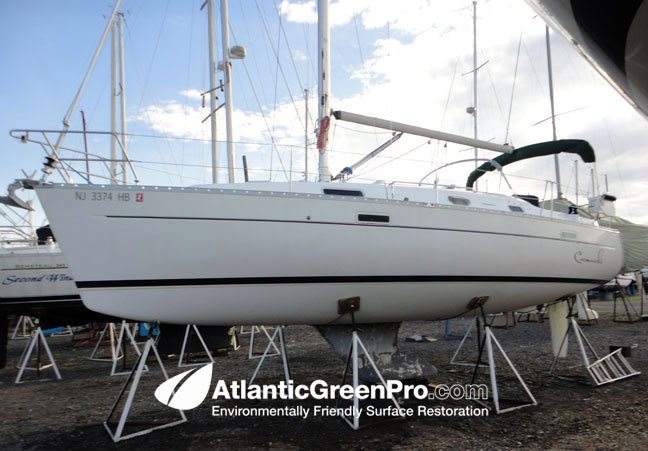 A gelcoat peel, relative to media blasting of paint, for a boat simply wishing to remove years of old paint is excessive and unnecessary. Sure, if you're just doing a bottom paint removal. He is clearly offering both options though. I think this is a good system for simple paint removal, but definitely not for a full peel. I'm sorry, I just re-read this post and no our process has nothing to do with bottom (gel-coat peeling). 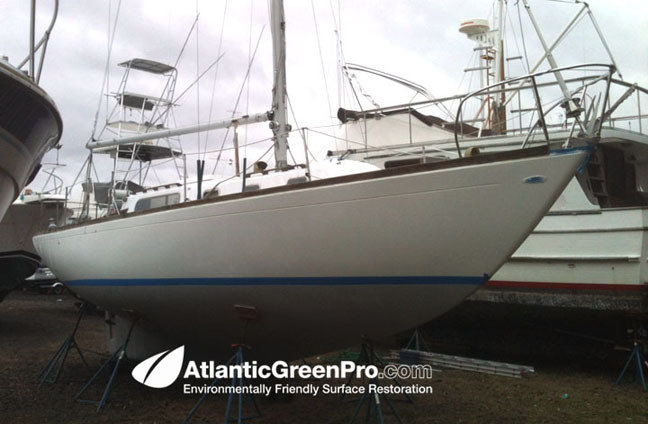 Our process is for bottom paint removal. From time to time we come across blisters in the gel-coat during the bottom paint removal process and our system can open those blisters up so that they can be repaired without going through the costly expense of a gel-coat peel as minaret is referring to. 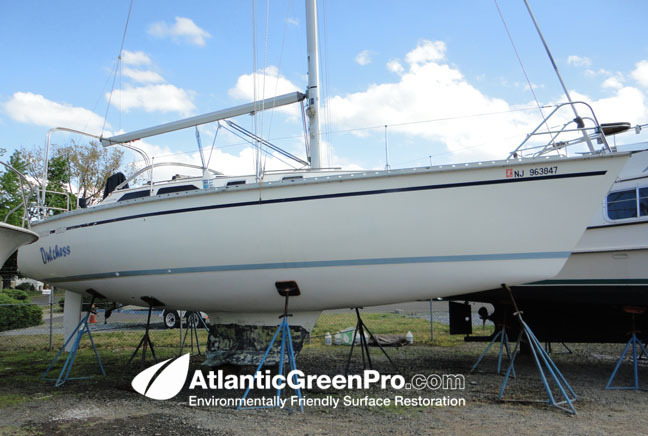 Again our process is for bottom paint removal so that your boat bottom can be re-painted properly with a barrier coat and ablative all without a huge mess. 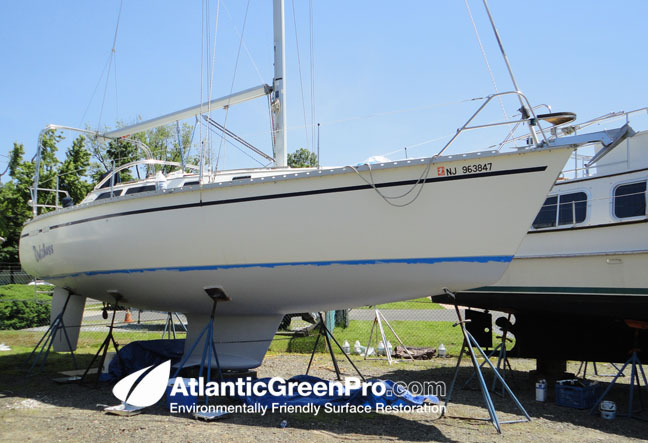 How do you dry hulls for barrier coating without removing the gelcoat? No point in putting barrier coat on a wet blistered hull, it will only make the problem worse.